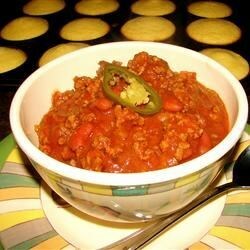 "A fairly simple and quick chili recipe!" In a large pot, mix the beans, corn, tomato sauce, tomato paste, and water. Bring to a boil, and reduce heat to low. In a food processor, finely chop the jalapenos, habanero, onion, and garlic. Mix into the pot. Mix in the cooked beef. Stir in masa flour. Season with cayenne pepper, chili powder, salt, black pepper, and sugar. Cook 45 minutes to 1 hour, stirring occasionally. I won a Chili Cook-Off at my office with this recipe! This is the BEST chili recipe I've ever made or tasted! Perfect amount of spice. Thanks. For anyone out their looking for a good chili recipe, this is the one! This was the spiciest, yummiest chili ever! It was very easy to make and not time consuming at all. My recipe, so of course I love it. But seriously, it's a really good and easy chili to make! I had to scale this recipe up to feed 30 people. It was probably THE BEST chili I have ever eaten. And for sure the best I've ever made. This recipe is a KEEPER! !